If you are looking for a roofing contractor in Phoenix Arizona you need look no further than Arizona Roof Rescue to meet all of your roofing needs. The experienced roofers at Arizona Roof Rescue are familiar with all types of roofing materials, including metal, shingle, tile, foam and rolled roofing systems. Arizona Roof Rescue is adept in the repair and installation of all types of roofs, whether commercial or residential. When you choose Arizona Roof Rescue you will receive attention to detail, no cutting of corners, and exceptional customer service. As an example of our commitment to customer service we offer 24/7 emergency repair services to help ensure that a small problem doesn’t become a big problem. A leaking roof can cause a great deal of damage in a short amount of time. Additionally we offer assistance filing home insurance claims as we have valuable experience in working with insurance companies. All of our technicians are all NATE certified (North American Technicians Excellence) meaning they are recognized as meeting the highest industry standards for installation and services of HVACR equipment and systems. When you call Arizona Roof Rescue you will receive friendly, competent and efficient service with a 100% guarantee on workmanship. Arizona Roof Rescue owner, Alan Monzon, stresses the significance of complete customer satisfaction at a competitive price. This means better customer service, fewer problems and better advertising through word of mouth. 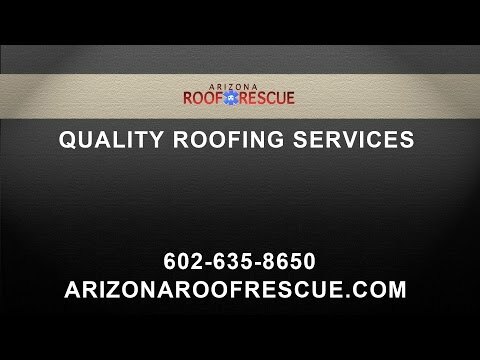 Arizona Roof Rescue stands by our craftsmanship and we are dedicated to making sure that our customers are 100% satisfied. The professional roofers at Arizona Roof Rescue are fully licensed, bonded and insured to keep you, the home owner protected. In addition we maintain a membership in good standing with the Better Business Bureau. You can count on us to get the job done in the amount of time you were told and with no surprises in the cost. The good name of Arizona Roof Rescue means a lot to us, and we keep it by ensuring 100% customer satisfaction from the pre installation roof inspection to the debris clean up and final inspection. When you need your roofing repaired or replaced in Glendale, trust the roofing experts at Arizona Roof Rescue. The monsoon season in Arizona can quickly damage your roof with its strong winds and heavy rain, but the Glendale Roofers at Arizona Roof Rescue can fix any roof damage imaginable. As one of the most common types of roofing in Arizona, getting properly installed tile roofing in Glendale is easy when you come to Arizona Roof Rescue. The tile roofers at Arizona Roof Rescue can repair or replace your tile roof, with quality roof tiles backed by an industry leading warranty. For the best shingle roofing in Glendale, come to Arizona Roof Rescue. Our professional roofing contractors are capable and qualified to provide you with excellent quality shingle roofing installations or repairs in Glendale. You can trust the experts at Arizona Roof Rescue. Arizona Roof Rescue is the new answer for Glendale Roof repair. We have combined the experiences of master roofing contractors of different disciplines to form a roofing company that can answer the call of all homes in Glendale. Whether you have a regular 3-tab roof, an asphalt upgrade, clay tile, tile roofing or any form of membrane roof, for any commercial or residential applications, we are the company you need to come to for your roof repair. We believe that customer service means answering every roof repair call that we can. That is why our staff is trained in all types of roofs. By helping you with your current leak or repair issue honestly and fairly, no matter what material your roof is composed of, the word will get around. When you need a major repair from a tree falling or moisture damage, you will remember our skill, our courteous and respectful crew and our professionalism. We are a full service roof repair company, which we provide licensed bonds and insured service to the residents and companies to cities all over the valley! At Arizona Roof Rescue, we are proud to serve many different areas of Glendale, including roofing services for Historic Downtown Glendale, Historic Catlin Court, Old Town Gilbert, Westgate, and more. Headquartered in downtown Glendale in the 85301 area, we provide quality roofing services for both commercial and residential properties in Glendale. Finding a Glendale Roofer near you is easy with Arizona Roof Rescue. Servicing the 85302, 85303, 85304, 85305, and 85306 areas and all of Glendale, you will find no better roofing contractor than those at Arizona Roof Rescue. Backed with an A+ rating on the Better Business Bureau, finding a Glendale Roofer near you can be fast and easy with Arizona Roof Rescue! Located in the 85308 area in Glendale, our Arrowhead roofing services include tile roofing, shingle roofing, roof repair, re-roofing, and more. Proud to serve the Arrowhead area, Arizona Roof Rescue has an A+ rating with the Better Business Bureau and five star reviews on Yelp, Google, and Angie’s list so that you know you are getting the best quality roofing services in Arrowhead.